As much as I love fall (the apples, the cooler weather, the leaves! ), I also find that it's one of the most stressful times of the year for me. There's so much to get done at work and so little time to get it done. So much to worry about. So much to think about. So much to do! And as each year starts, I start to worry if I'm good enough. If I'm old enough, experienced enough, qualified enough. The kids don't worry me as much as the parents, to be honest. As a young teacher, a lot of parents look at me as if I don't know anything even though I've worked with preschoolers for nearly half my life (I started volunteering to help in preschool Sunday School classes in 6th grade). I let it all go to my head. Part of me wants to prove them wrong but the other half wants to shrivel up and second-guess myself. I know that I've got what it takes but I let their thoughts (even if they don't say it aloud) go to my head and let it speak louder than the truth. I've never had a good feeling of self-confidence. I've had bouts, but I've always struggled with feeling good enough, whether it's my body, my smarts, or in this case, my job. I'm not writing this asking for sympathy or a "you're amazing, girl!" but rather because I weirdly enough need to remember this and get this out of my system. I need to write about it and I need to let it all go. +Stop comparing. I find that when I compare myself to others, I'm never good enough. Whether it be the people on television, the people on Facebook, or the people I work with, I cannot compare myself to them. Comparison truly robs me of joy. +Give myself more credit. Not because I deserve it, but because I need to view myself in a better way. +Realize and accept that I can't be the best. It's just not possible. Perfection isn't possible. And while it may seem depressing to some, I see it as potential for growth and a reason to relax a bit, too. 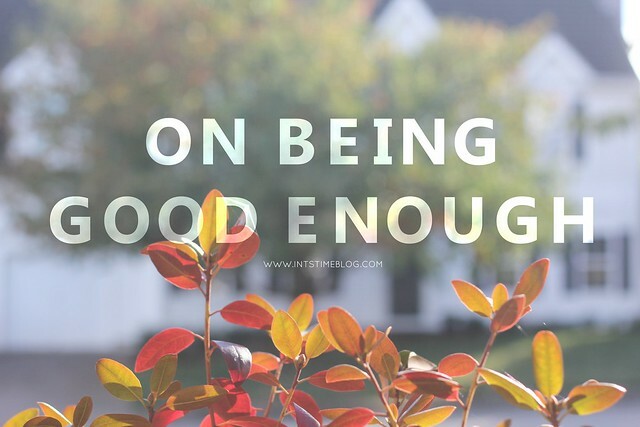 So do you ever have feelings of not being good enough? What do you do to prevent/cure it? I feel you so much on this girl! Yes and yes. And you are great! Don't we all compare at some point? One of the big threads woven into Allume was that thought... comparison to others and how dangerous it is. It's such a hard temptation to fight! I am right there with you on everything you said. I'm just trusting God that He knows what He's doing and is putting me where I am because with His help I'm capable. Of course, that's easier said then done. First of all, I am praying the Lord sends you a parent who will be a champion for you. A parent who is grateful for all you do and who takes the time to thank you. On worry a long time ago, a friend of mine mentioned that "worry" is our culture's socially acceptable sin. It can be so damaging and consuming. I'm so glad you're seeing this and fighting this tendency. I may not be the best teacher out there, I may still have things to learn (because I do and truly believe we all can learn), but I am enough. - loved this. So much. You are enough, Kiki. And more. Lovely post. A friend who homeschools her kids said, "I can't do this. I'm not good enough." Her friend said, "You can't without the help of the Lord." We can't do anything of this without His help and seeking Him daily. Our confidence and trust always has to come from Him and not our own abilities in inablities. I think of Timothy who was young and now had to preach and Paul encouraged Him to not worry about that but remember Christ. He knows our weaknesses. He knows the things we struggle with but when we lean on Him and ask for help and wisdom He gives it to us. I never feel like a good enough parent and I think someone else could do a better job. But this is where the Lord has me and because I'm leaning on Him He helps me to serve my family with joy. This way He gets the glory and praise. You definitely need to give yourself more credit, my friend! AMEN!!! "comparison is the thief of joy" -CS Lewis. you are amazing girl!! You are enough! And incredible! I totally get where you're coming from! We all need to speak truth into each others lives and assure one another that we are good enough! Kiki, you ARE good enough! Oh man, I am WITH you on this girl. It's so easy to question and doubt, but remembering that we are enough is so important. 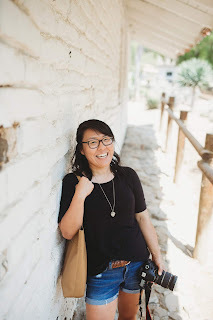 The second I start comparing myself with people around me, the more and more and more discouraged I become....but I am so thankful for God's faithfulness in using books, blogs, and people around me to encourage and affirm who God created me to be. Yes, we do! :) I feel like it's something that I'm constantly trying to overcome and yet find myself falling into that trap more often than not. Comparison is definitely dangerous and a terrible temptation, too! Secondly, I love what you said about worry! It's so true that worry is seen as an acceptable sin (making it that much easier for me to fall back on it!). Like you said, it's a consuming, damaging, and just plain terrible habit to have! Lastly, so glad you understand about the self-confidence thing! I'm glad I'm not alone in this boat. :) You are more than enough, too, friend!! Thank you, Ladonna! I love that you pointed me right to Jesus because in the end (and really, in the beginning of each day and every moment in between!) I need to be looking and turning the Him. I've been trying to really work on surrendering to Him and just realizing that I CANNOT do it all on my own. I love what you said about God knowing our weaknesses. There is so much truth in that! I heard on the radio recently (by Luis Palau, I think) that we were created for a relationship with Christ because He knew how much we needed Him (or something to that effect). What you said really just affirmed that because God does know our struggles and wants so badly for us to turn to Him so He can help! So everything you just wrote? Just another message I know God placed into my mind and heart that I know is anything but coincidence! I feel like it's definitely something that young adults relate to. I feel like with occupations such as teaching or counseling, it's bound to happen to young adults in these jobs because people are skeptical--especially if there are situations where they might not be right (you know?). Anyway, I love what you said about our culture valuing perfection. It's impossible and something we're all taught, but yet it's something we still strive for--even if it's impossible to reach! And I also love what you said about having God meet us where we're at. SOOOO true and such a great reminder. I'm off to go watch the Francis Chan video now! I've seen him around the web a lot lately but have yet to read any of his book(s?). I think i need to change that asap! Thanks again for these sweet words, Britney! It means a lot hearing them from a close friend like you! It's wayyy to easy to play the comparison game! uuhhmmm... did you write this about me!? I literally just spent the morning telling myself all of those things... I'm not good enough, you can't do this, you can't do that, you didn't do this... I have been stressed out the past couple of weeks and it all hit me this morning!! I will be praying for you that you can remember those things and that our worth is found in our Father, and not our jobs or how good we are at it. And even though you weren't looking for it, you ARE super duper AWESOME! Yes you should read some of his books, Crazy Love, and forgotten God are really good! He also has a new one out that he wrote with his wife, that i wanna read. No problem girl! We need to have that skype date soon!! Let me know when you can. I think I heard more about his books because of the new one coming out that he wrote with his wife (I think that's the one that they're going to donate proceeds for, right?). I really want to read Crazy Love because I've heard it's one of those must-read books and he sounds like a fascinating person, too! Agreeeeed. It's way to easy for me to fall back into that game/trap. Oh girl, so glad to hear I'm not alone in this AND that you read this with such amazing timing! Great tips and articles!! I definitely struggle with this in a lot of areas in my life... and I know there's a new one coming with motherhood too! Stop comparing=YES! This is one of the things I am most guilty of and it truly does steals your joy. Excellent post. AMEN! I can definitely say it to others but can never really accept it and hear it from myself. It's almost like when people compliment me and I say thank you but don't always feel like it really sinks into my heart and mind. And I never would have connected that to Satan. But it's sooo true. We have to remember that sin is there and that we have to strive for HIM, each and every day. Thanks for those wise words, friend!